“oh rowan tree, oh rowan tree, thou’ll aye be dear to me." As mentioned in my previous post, I have long held a fascination with the mythical-mystical Rowan tree. How funny then that I find myself living side by side with this fellow native European on a land that is not quite our own. Indigenous in varying sub-species throughout the cool, temperate regions of the Northern Hemisphere, the true Rowan (aka. sorbus aucuparia) goes by many names including mountain ash, quickbeam, bird-berry and witchwood. 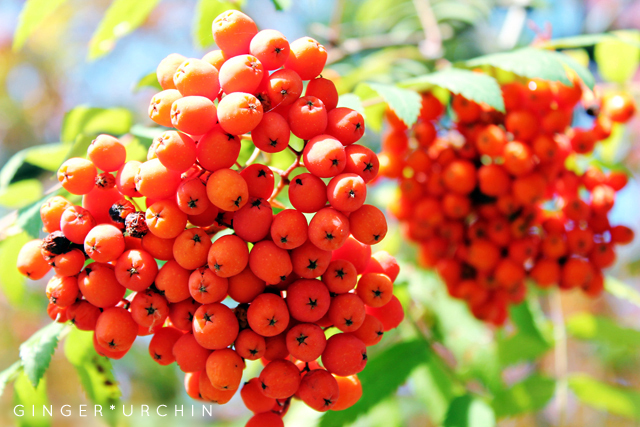 The folk-name of Rowan itself comes from the Old Norse ‘reynir’, meaning ‘to redden’. With its symbolic bright red berries each with a tiny five-pointed star, the hardy and versatile Rowan tree held a long tradition of sacred-magickal connection among ancient peoples across Northern Europe. Rooted (no pun intended) in Norse mythology with the rescuing of Thor from a river torrent by the goddess Sif in the guise of a rowan, the tree became inexorably linked to its supposed protection against lightening and unfavourable forces. From this the practice of hanging rowan branches over the doors to house and barn for such protection can easily be understood. By extension a miniaturised version was made by taking two small rowan twigs and binding them with red thread into an equal-armed, solar cross and carried about one’s person, most often then being sewn into clothing. Further mythology surrounding the rowan appears in ancient Greece where the eating of rowan berries was reserved only for those times when giving respect and honour to one’s ancestors (Halloween feast, anyone?). Curiously, both in ancient Greek myth and Ojibwa legend the rowan’s feather-like edged leaves and bright red berries are referenced as being linked to the blood of birds, and one wonders whether this has anything to do with the interaction of early peoples and their migratory journeys. Certainly the rowan-berries favouritism among many bird species was long exploited by human hunters. For the esoteric practitioner Rowan can be harnessed in a plethora of ways from sacred firewood and incenses, wand and stave-making, to a variety of edibles and beverages all to the purposes of inviting benevolent familiars, spirit guides and elemental creatures to one’s aid. In particular for the poet (and indeed I would imagine all wordsmiths), Rowan was believed to enhance creativity and set the creative process flowing. Even putting aside all this rich mythology and folklore, the Rowan has been proven to have had very practical uses that can still be explored today. Its dense wood is used for carving and turning, for tool handles and walking sticks, sled shafts and rake spikes. The fruit was once a traditional source of tannins for mordanting vegetable dyes, including that of the Rowan bark itself that was used to dye wool brown or red. 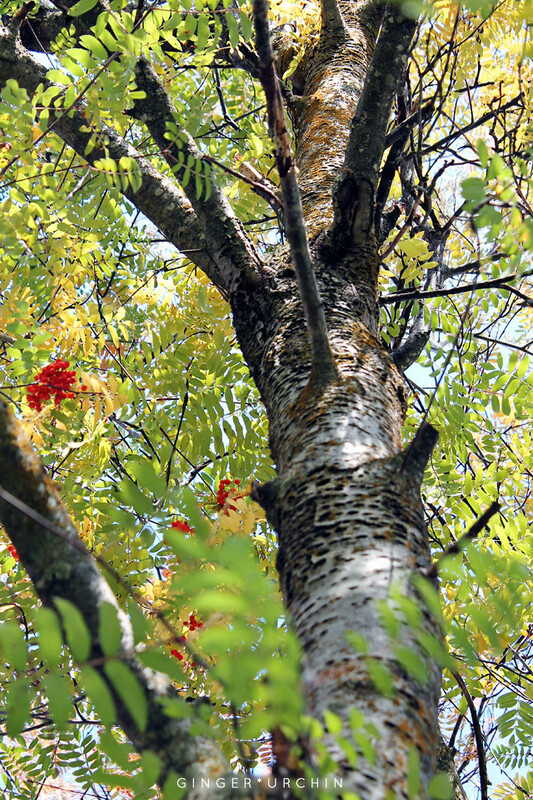 Long considered a wild food staple for both human and livestock when a wider variety of indigenous fruits were commonly eaten, Rowan bark can be used in a number of herbal folk remedies including a tincture to treat fevers. High in vitimin C, the berries can be preserved as jam or jelly, and are useful for treating sore throats and tonsillitis. Meanwhile modern homeopaths use extracts of Rowan to treat eye irritations, neuralgia, gout and spasms of pain in the uterus, bladder and heart.